Big time sports need money and spectators. Technology is important, bringing spectators to the game or the game to the spectators. Historically, governments and the rich used sports to show status and entertain the masses. The Roman poet Juvenal wrote satirical poems for the educated elite. His “Wrong Desire is the Source of Suffering” (Satire X), lamented the deterioration of Roman civil society about 150 years after the end of the Roman Republic. Juvenal wrote: “The People have abdicated our duties … and care now about just two things: bread and circuses” (Satire 10.77-81). Food and entertainment were the only things that mattered to Romans of his time, he ranted. Entertainment included many spectacles, gladiatorial contests, and chariot races. Eight centuries later, the Roman empire was gone and literacy declined in the West. In Baghdad, seat of the great Abbasid caliphate stretching from the Atlantic to India, the rich enjoyed horse racing and polo (polo began in Persia) in luxurious settings along the Tigris River, while lower classes raced camels, dogs and pigeons. Horse racing was welcome in the colonies that became the Southern United States, but frowned on in the puritanical northern colonies. Baseball and football began in the Northeast; rules and organization came with the invention of the telegraph and the improvement of railroads. Baseball rules recognizable by modern fans existed by 1850. Western Union began business in 1851. Baseball began as a professional or semi-pro sport. Baseball’s National League opened in 1876. Its westernmost team was in St. Louis. Spectators and teams traveled by rail. American football began as an elite college sport. Rutgers and Princeton played the first college football game in 1869, a rugby-soccer hybrid with 25 players on a side, very different from today’s game. The Sporting News began publication in 1886; the first All-America team (all of whom played for Harvard, Yale or Princeton) was published in 1889. The first postseason football game was the Tournament East-West football game, in Pasadena, between Michigan and Stanford, in 1902. Teams now had three downs to gain five yards, but the forward pass was illegal. How did this happen and why wasn’t that first post season game played on the East Coast? Marching bands and motorized floats soon followed. By 1895, the event was too large for the Valley Hunt Club; the Tournament of Roses Association was formed. By the 11th annual festival (1900), the site was re-named Tournament Park, an open area directly adjacent to Caltech (It wasn’t called Cal Tech until 1920). New activities included ostrich races, bronco busting and a race between a camel and an elephant. Reviewing stands were built along the parade route and Eastern newspapers began to send reporters starting in 1898. The Tournament of Roses added football in 1902– the first post-season college football game ever. Stanford played the powerhouse University of Michigan team. They were crushed 49-0 and gave up 8 minutes early. The lopsided score and a stampede for seats in cramped Tournament Park suggested a need for change. This was Roman style chariot races, borrowed from the popular Broadway play, Ben-Hur, which opened on Broadway in 1899 and ran for 21 consecutive years. This famous play included a spectacular live chariot race with real horses and chariots. 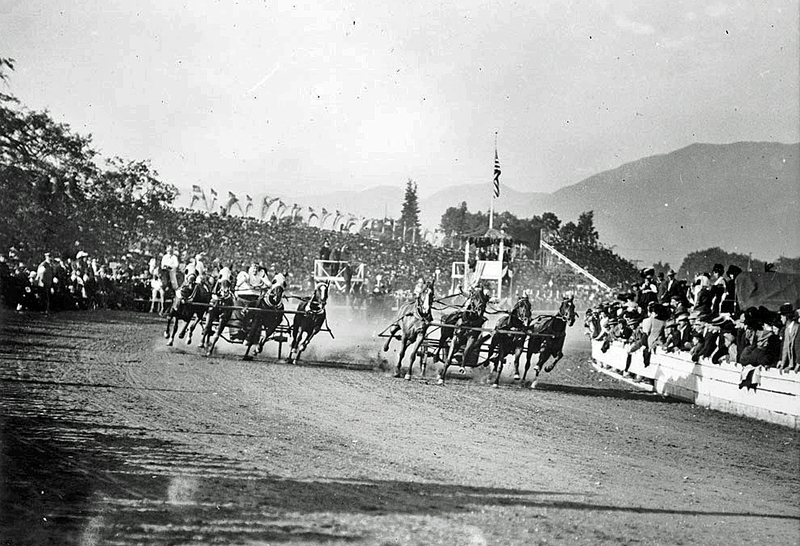 1911 chariot race at Tournament Park. Photograph courtesy of University of Southern California, on behalf of the USC Special Collections. a. Why was the first postseason game played in Pasadena rather than Florida, much closer to the Eastern birthplace of football? Pasadena was bigger, more accessible, and there was a precedent for teams traveling to California. The 1900 census showed Pasadena 9,117 vs. Miami 1,681 and the city of Los Angeles topped 100,000. The city of Miami wasn’t incorporated until 1896. Industrialist Henry Flagler built up the Florida Atlantic Coast with The Florida East Coast Railway and hotels in St. Augustine and Palm Beach in the 1890s, but this was beach tourism. Key West was the largest and wealthiest city in Florida in 1890, when Pasadena held its first winter festival. Los Angeles and San Francisco between them had over 400,000 people in 1900, whereas Jacksonville, the largest Florida city, had only 28,429. The legendary undefeated 1869 Cincinnati Red Stockings baseball team played 6 games in San Francisco and Sacramento in September and October 1869, only a few months after the famous Golden Spike connected the two coasts. No railroad reached LA until 1876. Cincinnati traveled to Memphis and New Orleans in 1870, but never to Florida. Flagler’s railroad reached Biscayne Bay in 1896, Key West only in 1912. The Pasadena and Pacific Railway, ancestor of the famous red cars, was created in 1895 and took passengers from Pasadena to Santa Monica. That’s another story, however. Football fell out of favor in California as part of the East Coast revulsion against football injuries and commercialism in 1905-1906. The largest colleges, Stanford, UC Berkeley (the only UC campus at the time) and then USC eliminated football, replacing it with rugby from 1906-1917. Some high schools switched from football to rugby. However, interest in rugby, like that in chariot racing, faded. I hope to cover California’s rugby years in another segment. Football returned to Pasadena in 1916; the crowds soon outgrew the stands in Tournament Park. A larger venue was needed. The Tournament of Roses paid for the new stadium. The first game was in December 1922, and the first New Year’s football game was in 1923. 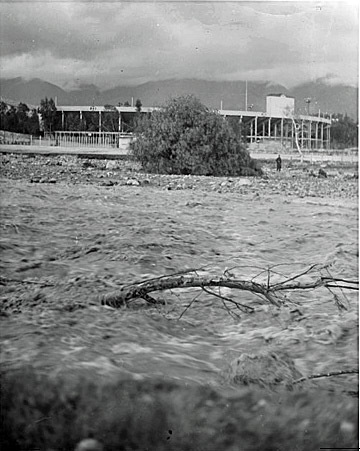 Both the game and the stadium were soon called “The Rose Bowl.” The stadium was called a “bowl” because of its similarity to the Yale Bowl, built in 1914. Football was a more national sport by 1915, with Eastern teams occasionally playing on the West Coast and vice versa. Several Eastern teams declined invitations to the 1916 game. Powerful Syracuse had played 3 games at Montana, Oregon State, and Occidental in November and early December. Yes, Syracuse played Occidental and won 35-0. This was the fourth and last game of the season for Occidental, who joined four other small colleges to form the Southern California Intercollegiate Athletic Conference (SCIAC) in 1915. Nebraska and the University of Michigan also declined invitations to visit Pasadena. Brown was a fourth choice, but most authorities believed that East Coast teams played a better brand of football than the reduced number of Western universities still playing football. Favored Brown lost to Washington State 14-0 in a rainy 1916 Rose Bowl game; newspapers all over the country carried reports of the game. The forward pass was now legal but incomplete passes carried a 15-yard penalty. Running back Fritz Pollard of Brown was the first African-American to play in the Rose Bowl, but not the first African American named to Walter Camp’s All-America team. He later played for the Akron Pros in the American Professional Football Association, which became the NFL in 1922. Akron had an undefeated season in 1920. Pollard went on to coach several teams and was elected to the Pro football hall of fame in 2005. We’ll review that 1920 schedule against teams like the Wheeling Stogies and the Dayton Triangles in topic 3, evolution of the NFL. Famed African-American singer and political activist Paul Robeson was an All-American football player (tackle and end) at Rutgers and played against Pollard in college, they played together for the 1921 Akron Pros. Pollard and Robeson moved and played together in 1922 for the Milwaukee Badgers, a new team. Robeson lost interest in football, Pollard did not. 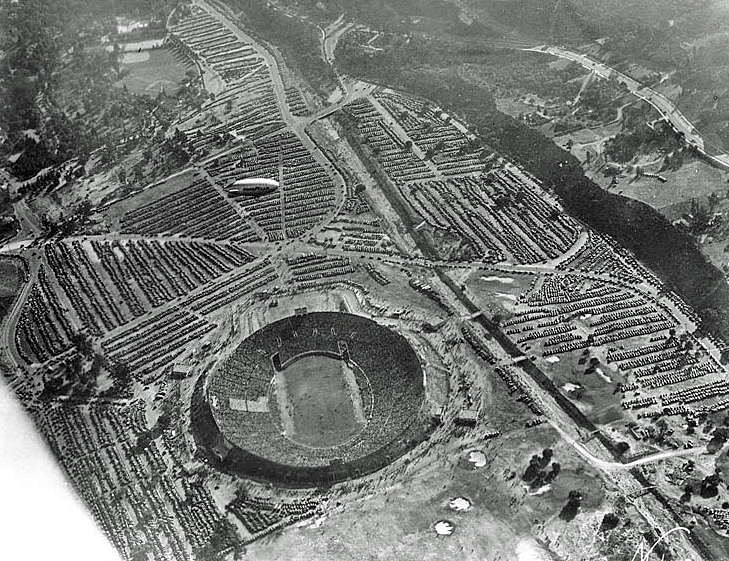 Aerial view of 1926 Rose Bowl game, looking North. Photograph courtesy of University of Southern California, on behalf of the USC Special Collections. This aerial view of the 1930 Rose Bowl game shows the new bowl shape, the Goodyear Blimp , the water channel in a semi-natural state (no concrete), many cars, but none on the golf course. Photograph courtesy of University of Southern California, on behalf of the USC Special Collections. The forward pass was legalized in 1906 as part of reforms to reduce injuries. It wasn’t used often in the 20s- many teams used the single wing offense created by Glenn “Pop” Warner, coach of the very successful Carlisle Indian school in Carlisle, PA. Carlisle perfected the use of the forward pass before other schools and coached the legendary Jim Thorpe, who helped them upset Harvard in 1911. Ivy League and Middle Western teams dominated football in that era; pro football got little respect. This began to change in the late 1920s when college stars like Red Grange (from Illinois) and Bronco Nagurski (Minnesota) joined the pros and brought media attention. Southern football teams became more visible as Alabama won the 1926 and Georgia Tech the 1929 Rose Bowl. The Rose Bowl was one route to prove national stature. The famous Notre-Dame USC rivalry began in 1926. The largest crowd ever to attend a college game was in 1927 at Chicago’s Soldier Field, when over 123,000 fans saw Notre Dame beat USC 7-6. Miami launched a New Year’s Day Palm Festival in 1933, including a game between the University of Miami and Manhattan College. The game was renamed the Orange Bowl and the festival the Orange Bowl Festival in 1935 following the Rose Bowl’s example. An Orange Bowl Parade was started in 1940 but no longer exists. The Sugar Bowl began in New Orleans in 1935. Two more bowl games began in Texas: El Paso’s Sun Bowl in 1936 and the Cotton Bowl in Dallas in 1937. There were many defunct bowl games, some of which were played only once, such as the Cereal and Dust Bowls. The Bacardi Bowl in Havana, Cuba was played irregularly starting in 1907. Few Californians know about the one shot Los Angeles Christmas Bowl played at the Coliseum in 1924. USC defeated the University of Missouri 20-7. The Trojans were coached by Elmer Henderson, the winningest coach in USC’s history, with a record of 45-7 (.865). Some authorities call it the Los Angeles Christmas Festival rather than Christmas Bowl. 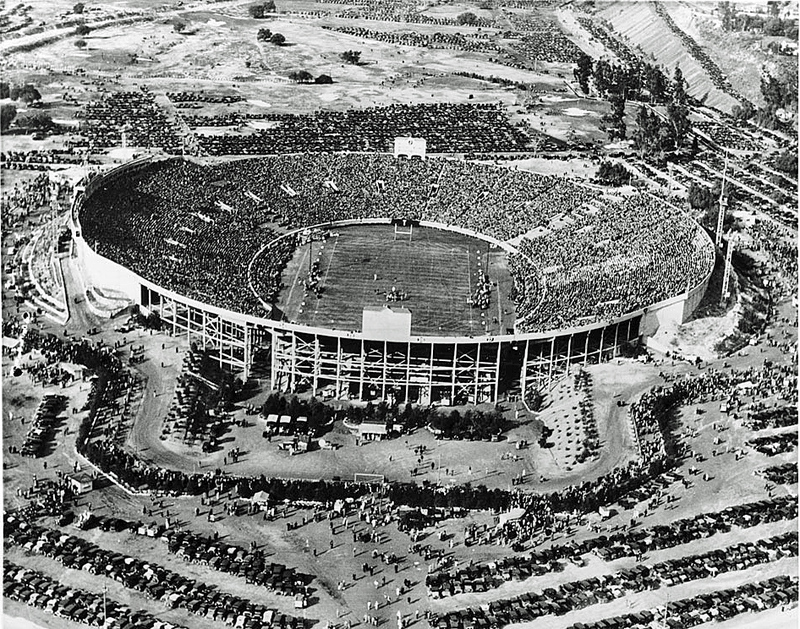 It was a Rose Bowl competitor, and attracted 47,000 fans. The 1925 Rose Bowl one week later drew 53,000 fans and featured two of the most famous coaches of all time: Knute Rockne and Pop Warner, now at Stanford. Notre Dame won 27-10. There is talk of reviving the Christmas Bowl- you can Google LA Christmas Bowl. The Pacific Coast Conference was formed in 1915 by UC Berkeley, Oregon, Washington and Oregon State University. USC joined in 1922 and UCLA in 1929. UCLA started small, playing in the SCIAC with teams like Occidental, Redlands and Cal Tech from 1920-28. USC was suspended in 1924 for allegedly paying players, see Stanford, USC & 1924 football scandal. The scandal was related to Coach Henderson’s dismissal after the 1924 season. The NFL voted to exclude black players in the early 1930s; they had no African-Americans from 1934-46. Fritz Pollard coached the Harlem Brown Bombers, named after Joe Louis. Many people know that Jackie Robinson played college football; few know that he was part of the famous all black 1939 UCLA backfield: Robinson, Ray Bartlett, Kenny Washington and Woody Strode. Washington was the best footballer, UCLA’s first All-American and led the country in total offense. Washington, Strode and Robinson played in the Pacific Coast Football league, Robinson was drafted after the 1941 season. Washington couldn’t get into major league pro football until 1946 when the Cleveland Rams of the AAFC moved to Los Angeles and signed both Strode and Washington. The Cleveland Browns signed two outstanding black players that same year, Marion Motley and Bill Willis. Washington suffered major injuries; he was less successful as a pro than would have been predicted from his great college days. Marion Motley, however, was a super star who led his league in rushing and was famous also for his blocking ability. Cleveland coach Paul Brown later said that Jim Brown was a better runner, but Motley a better all around player. There was little money in the early bowl games. University of Oregon students sold the school store to raise money to send their team to the 1917 Rose Bowl. We’ll see in topic 2b how television, luxury boxes and big money drove the postwar sports world into an arms race that continues to this day. Pasadena grew in size and prosperity from 1900-1930. Southern California Edison originally provided electricity, but Pasadena established a Municipal Light and Power Department (now Pasadena Water and Power, PWP), in 1906. Men such as former mayor Dobbins and John J. Hamilton sought to establish an analogous Pasadena Municipal Railway to replace the privately owned Pacific Electric System, citing poor service. However, the chamber of commerce and Pacific Electric won a decisive victory in the 1920 election, ending this idea. The red cars became mired in heavy auto traffic by the 1930s. The Automobile Club of Southern California proposed an elevated “Motorway System,” replacing the streetcar lines with buses that ran on local streets and new express roads. When the freeway system was planned in the 1930s, city planners intended to put light rail tracks in the center margin of each freeway. This never happened. The Arroyo Seco Parkway (later Pasadena Freeway) our first freeway, opened in 1940, running in the lower Arroyo. Major cutbacks in service began before World War II. Congestion was severe by the late 40s. Schedules could not be met, and former patrons were now driving. City, county and state agencies agreed with the Pacific Electric that termination was the best solution. Thus the end of the red care era merged with the smog era. The word smog appeared more than 100 years ago and links between air pollution and big cities were recognized before 1910. Smog first surfaced as a local issue in the summer of 1943 when complaints about air quality skyrocketed and newspapers wrote about a “gas attack”. Los Angeles County appointed a smoke and fumes commission and restrictions on trash burning soon appeared. Pasadena began to buy Arroyo Seco land for water rights in 1911. The Los Angeles County Flood Control District built The Devil’s Gate Dam in 1920 after major floods in 1914 and 1916. It served for flood protection and water conservation. The dam and increasing population further depleted the Raymond Basin water table. The Devil’s Gate Dam helped contain the massive floods of March 1938, but water came over the spillway and wreaked havoc in the Arroyo. Massive flooding throughout Los Angeles and Orange Counties caused about 180 deaths. Lawsuits brought restrictions on water removal, which are administered today by The Raymond Basin Management Board. Today about 35% of Pasadena’s water comes from the Basin. Pollution has been one problem. JPL dumped large amounts of solvents, rocket fuel and other chemicals near to Devil’s Gate. Concrete has been another problem, preventing rainwater from percolating down into the subterranean reservoirs. Our modern Arroyo was evident by 1950. The iconic Colorado Street Bridge was built in 1913. The city began planning for a park in the Arroyo in 1919. 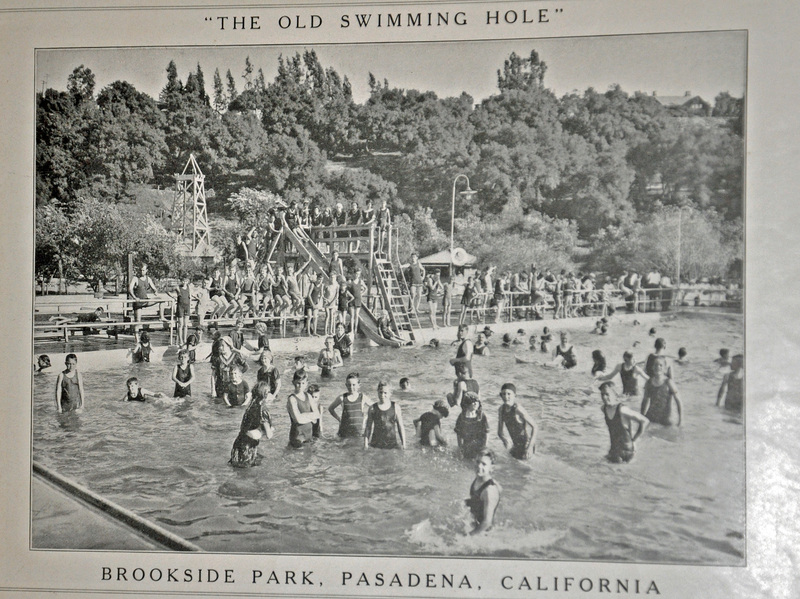 The Brookside Plunge, predecessor of the Aquatic Center, opened in 1914, named for Mrs. Everett Wellington Brooks who gave $3000 for a public park in the Arroyo. The Plunge excluded people of color except for one afternoon and evening per week, the last day before the pool was emptied and cleaned. When the NAACP challenged this, the city banned nonwhites completely from the Plunge until 1929, when Tuesday afternoon, International Day, was set aside for minorities. Frictions continued and increased; eventually the NAACP sued for open access and was victorious. Now the city closed the Plunge to everyone. Further NAACP legal action forced it to reopen in 1947. The Plunge fell on hard times and closed in 1983. The new Aquatic center was built and opened in 1990. The Rose Bowl was completed in 1922, providing a bigger and better site for football and other events than Tournament Park, where the 1st Rose Bowl game was held in 1902 (see topic 2, evolution of big time sports in Pasadena). The first nine holes of the Brookside Golf Course opened in 1925; it grew and soon became an integral part of Rose Bowl operation because it was used for parking. Myron Hunt also designed the stadium, dugouts, and clubhouse of Jackie Robinson Memorial Field (originally Brookside Park Baseball Field) constructed in 1932. The Chicago White Sox used Brookside for spring training in 1933. The Fannie Morrison Horticultural Center was built in 1938, funded by a $55,000 donation from Fannie Morrison. It was used for flower shows, which were very popular in its first 25 years. It fell into decline after 1980, the buildings were leased by the Kidspace Museum in spite of opposition (see http://www.arroyoseco.org/kidspaceplan.htm & http://www.arroyoseco.org/documentsmuseum.htm. Kidspace has been a pleasant surprise, less grand than its backers hoped, and less bad than its detractors feared. Pasadena prospered during World War II and JPL grew into a famous site and major employer, but Pasadena went through difficult times after 1950. This was partly due to racial conflict centered on the schools. Three families, 2 white and one black, filed suit in 1968 against the Pasadena United School District. This eventually led to Pasadena becoming the first non-Southern school district to undergo court-ordered busing. A landmark LA Times article dated April 27, 1969 spoke of “Pasadena’s Crown City Image Tarnished, white flight, urban blight, school problems”. It alluded to an “Eastern city death syndrome”. Townsend spoke of a ghetto half a mile from the world’s most famous stadium and quoted a white mother who feared that the schools would soon be “less than 50% Caucasian”. Proposition 13 hurt city revenue. However, things improved in the 80s. Neighborhood and preservation groups defeated a proposal to build two downtown high-rise towers in 1981. Renovation of the Old Town district proceeded through the 80s with visible success. City staff and neighborhood groups sparred over use of the Arroyo in the 1980s; this has periodically resumed. The city of Pasadena invited Dodgers’ owner Walter O’Malley to use the Rose Bowl in 1957, until a new stadium was constructed. This was abandoned in view of extensive construction that would have been necessary. City manager Donald McIntyre announced plans to cut costs and realize $2 million annual income from the Rose Bowl within two years in 1981 (Pasadena Star-news 5/23/1981). A plan to merge the management of the Convention Center, the Arroyo Seco and the Rose Bowl was rejected. Neighborhood and preservationist groups passed a slow growth imitative over the objections of the Chamber of Commerce and black leaders in 1989, but this was soon reversed. We humans tend to overdo things. Borrowing can be creative, but massive debt is harmful. Antibiotics were marvelous when they were introduced, but their use for every cold and for livestock is bad. Dams and concrete are good in their place. Dams are being removed in the Pacific Northwest; I hope that some concrete removal may permit more rainfall to percolate down into the Raymond Basin. American football has overdone commercialism and violence (topics 3 & 4). The Pasadena Cycleway was outmoded by the time it opened. Local governments approved the dismantling of the red car lines and JPL pollution of the arroyo. passive accommodation to new technology can be a serious mistake. Topic 12, who moved our cheese, reviews 21st century problems, only some of which are financial. We must protect the arroyo and improve the health and quality of life for all Pasadena citizens. We can’t ignore financial problems, changes in revenue and city obligations. Not all change is bad. Air quality is much better than it was 30-50 years ago. Old Pasadena is much better than the decay that it replaced, but less attractive than it was in the 1980s. Crime has decreased. Old unresolved issues return (think of the invitation to the Dodgers for temporary use of the Rose Bowl), constructive solutions are possible if we think long term and avoid knee-jerk responses. I have borrowed much from Tim Brick’s Flowing Waters, Fruitful Valley; see http://brickonline.com/Brief%20History.pdf and his informative piece on the defeat of the Pasadena Municipal Railway in the 1920 election at http://www.brickonline.com/Muni%20Rail%202001.pdf. The collision of tectonic plates along the San Andreas Fault system formed the San Gabriel Mountains. Bending of the fault produced their east-west orientation, unlike the general southeast-northwest alignment of most California mountain ranges. This “Big Bend” in the fault transmitted forces 180 miles down from Parkdale almost to Wrightwood in the big 1857 Fort Tejon Earthquake. Another “big one” could severely damage both the I-5 Tejon Pass and the Cajon Pass (see http://web.mit.edu/murj/www/v10/v10-Features/v10-f5.pdf). Visit the Cal Tech Seismo lab for a sobering preview of such a big one on the San Andreas Fault. ( www.seismolab.caltech.edu/). Follow the water Native Americans settled on bluffs overlooking the Arroyo Seco draining the San Gabriel Mountains, including a major settlement at the mouth of Millard Canyon, near springs and artesian wells. Question, what are artesian wells? The San Gabriel Mission was built in 1771. Padre Jose Maria de Zalvidea built California’s first water-powered gristmill in 1816. Nearby Mission Lake (later Wilson Lake) was dammed for irrigation of orchards, vineyards and other crops. Wilson Lake survives today as San Marino’s Lacy Park. Joseph Chapman, former pirate and the first Anglo settler in southern California, built a sawmill in Millard Canyon in 1817, on a tributary of the Arroyo Seco. Settlers referred to Pasadena as a mesa, as it sits above the Raymond Basin higher than its neighbors. Pasadena is a Chippewa word for “crown of the valley”. The first orchards, subdivisions, and settlements used water from springs along the Arroyo or from horizontal tunnels into the hills to tap the waters within. The Indiana Colony Judge Benjamin Eaton, a Harvard law graduate, was Circuit Court Justice, district attorney and tax assessor in Los Angeles in the early 1850s. He lived briefly at Rancho San Pascual, just east of the Arroyo, but his wife died. Returning in 1865 with a new wife, he lived on the Fair Oaks Ranch and helped Benjamin Wilson and William Griffin build “Wilson’s Ditch,” bringing water from Devil’s Gate in the Arroyo to their rancho. Daniel Berry, representing the California Colony of Indiana, reported a great find in 1873. “The wood is plenty, the water delicious and cool, leaping out of the rocks on the side in little cascades.” Eaton built a water system for the new Indiana colony in 1874. He piped water from Devil’s Gate in the Arroyo to a reservoir near the present Colorado Street and Orange Grove Avenue. The city of Pasadena was chartered in 1886, after the postmaster rejected the name of Indiana Colony. 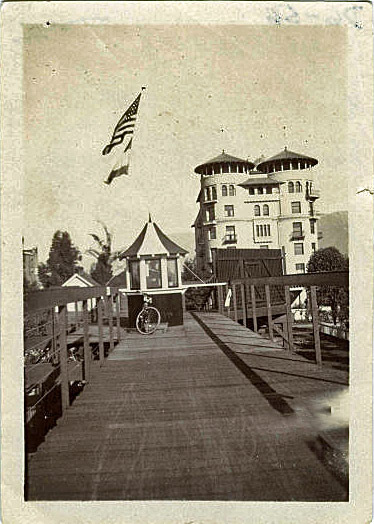 The first major hotel in the San Gabriel Valley, The Raymond Hotel opened in 1886. The first street car line, horse & mule drawn, running down Fair Oaks to Raymond, opened September 30, 1886. By 1900, people spoke of the “San Gabriel fruit belt”. The Arroyo was full of vineyards, fruit trees and other agriculture. There was no room for a sports stadium. Signs said, “No Chinese hired”. However, increasing population and increased pumping of water began to lower the water table, and some farms began to be abandoned. There were also squatters. 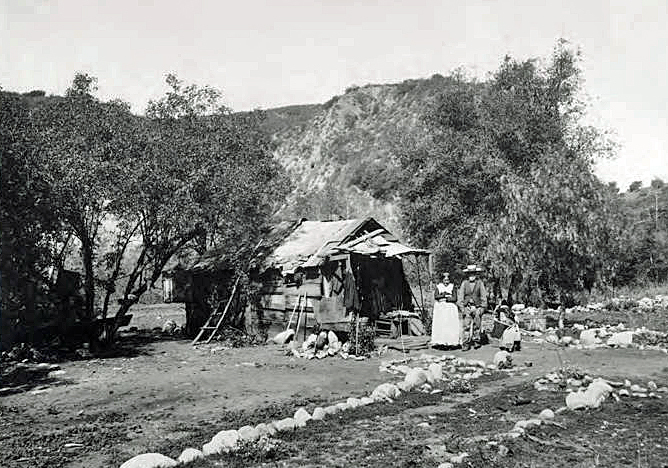 This 1897 picture shows squatters living near the present site of the Rose Bowl stadium. Pasadena grew rapidly, and the original Busch Gardens were built in 1904 at the edge of the lower arroyo below what is now California. They were built by Adolphus Bush, head of The Anheiser-Busch Brewing Co. in St. Louis. The Busch family used them as a vacation home, a very lavish 30 acre spot with many trees, open to the public much of the time and used for filming some movies, including Gone With the Wind. Busch died in 1913, the gardens remained until 1937. The 1909 picture below contrasts with a trash filled Arroyo only a few hundred yards north. Mayor Horace Dobbins formed The California Cycleway Company in 1897 to build a profitable bicycle tollway from the Green Hotel in Pasadena to downtown Los Angeles. Only 2 km of this elevated tollway were built when it opened January 1, 1900. “On this splendid track cyclists may now enjoy the very poetry of wheeling … At Pasadena they may mount their cycles and sail down to Los Angeles without so much as touching the pedals….”-(Pearson’s Magazine). The new Electric trolleys and the beginning automobile craze doomed it. Profit-making Cycleways were logical in 1897. California had many of them, as you’ll see at http://la.curbed.com/archives/2011/10/19th_century_california_bike_routes_werent_too_shabby.php. This public domain Wikipedia picture of the Cycleway was probably taken in 1904-5. You can see the Green Hotel behind the tollbooth. Theodore Lukens, naturalist, Sierra Club member, and Pasadena city councilman, cherished the forests and mountain waters above Pasadena. See http://www.sierraclub.org/john_muir_exhibit/people/tplukens.aspx for his friendship with John Muir. He said in 1911 “Pasadena does not need to look elsewhere for water now or in the future, if she will take care of the watershed from which her supply of water now comes.” But times had changed; water was less plentiful and the first electric trolleys had come to Pasadena in 1895. Pasadena’s 1910 population was 30,291 and the red car system was booming. The Pacific Electric Railway system or red car line opened in 1901 and became the largest interurban electric railway passenger system in the world by 1911. Travel from Pasadena to Santa Monica or Long Beach was easy.